Taylor has a habit of running away from her problems. That’s what she did at her family’s lake house the summer she was twelve, and five years later she still has no desire to return. 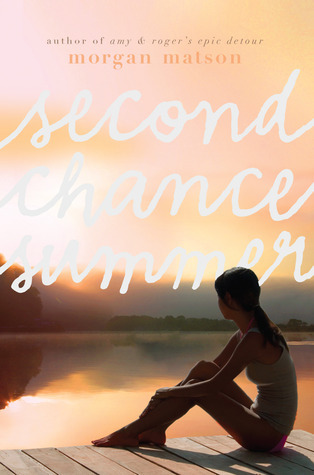 But this summer is different; her dad is dying, and her family has only one summer left together. Once back at the lake house, Taylor is surprised to find how much things have changed. As her family struggles to reconnect before it’s too late, Taylor is also forced to face her childhood friendships and mistakes…and this time there’s no running away. Morgan Matson’s second novel is a heartbreaker. Matson has created the perfect summer setting in Lake Phoenix; it’s idyllic and charming and full of so many important memories for Taylor. It’s the perfect place for her to really face her fears and learn how to deal with her relationships; the ones she has with her siblings, with her childhood best friend, Lucy, and with Henry, her first boyfriend and long-time friend. But the most important relationship in this book is the one that Taylor has with her father. Taylor not only has to deal with his illness and impending death, but how she expresses her feelings for him, and her anxieties that he doesn’t know how much she cares. Throughout the summer, she makes incredible strides in how she handles her stress, deals with being a runner, and learns not to back out when relationships get hard or messy. The pacing is beautifully done with a nice balance between the present and various flashbacks and memories throughout Taylor’s life. The characters are all fully formed and a lot of fun. Although heart-rending and highly emotional, Second Chance Summer is an incredible, entertaining, and funny novel that will not disappoint fans of Matson’s first novel. Cover Comments: I love the colors and the font here! This is such a pretty cover! Oh the book does sound like a heartbreaker but in a good way. I'm glad you liked it and I can't wait to read i too! It is a lovely cover. It's not often a book explores the relationships between a Father & daughter.